IA Design are engaged by Australian Super as their lead interior designer to deliver their national portfolio of workplace projects. This project at 2 Lonsdale Street, Melbourne is a project office that sits separately from the head office at 50 Lonsdale Street. 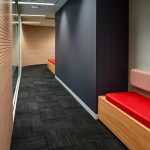 The Fitout was to encourage task-based work whilst providing collaborative/brainstorming zones for the occupants to access for team-based activities. The space incorporates Australian Supers branding colours using feature paints, materials and graphics. 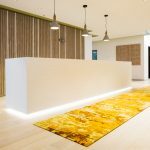 Feature timber screens, pressed wooden wall paneling and planting provide a tactile and fun aesthetic within the workspace. Collaborative huddle zones wrapped in whiteboards allow for spontaneous informal meeting spaces as well as being provided with traditional formal meeting rooms.